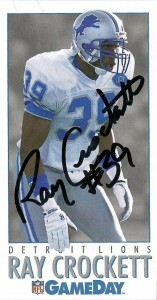 Ray Crockett is another in a long line of defensive players that came from the University of Baylor in Waco, Texas. For some reason, Baylor always had the luck of having some immense talent with Mike Singletary, Robert Blackmon, Thomas Everett, Santana Dotson, James Francis, and Vann McElroy all being drafted and having some great playing careers during the 80s and 90s. Originally a 4th round pick of the Detroit Lions during the deep 1989 draft, Ray didn’t get much playing time in the starting lineup his rookie season. In 1990, he’d make three interceptions starting opposite Leroy Irvin. 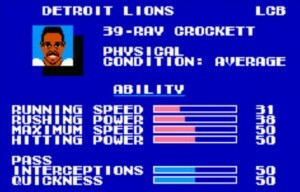 Solidifying the secondary in 1991, Crockett became a feared defender during the final years of the last Lions’ playoff runs. He’d make 6 picks and return one 96 yards for a touchdown against the Cowboys. 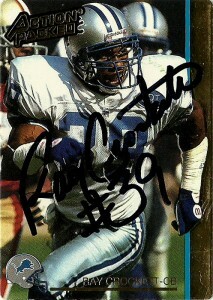 In 1994 Ray signed with the Denver Broncos. As teams would throw to the other side of the field avoiding Ray, his statistics suffered, but he’d continue to provide blanket coverage against unfortunate receivers. In 1998 and 1999, as a member of the Broncos Ray won Super Bowl titles with the franchise. Over his time with the Broncos, Ray logged 17 picks and a touchdown. After a nice season in 2000, in which he had 4 interceptions and a touchdown, Ray signed as a free agent with the rival Kansas City Chiefs for the 2001 season. He’d wrap up his career in 2002 with his 35th and 36 pick. Crockett over his career was also a fearsome corner blitzer, and was the career leader (surpassed by Rhonde Barber) at the position with 15.5 career sacks at his retirement in 2002. Since retirement Ray has done a variety of things. Touched by the paralysis of his friend and teammate Mike Utley, Ray’s participated on Morgan Spurloch’s show “30 Days”, spending 30 days in a wheelchair focusing on the everyday challenges that physically challenged people deal with in their lives. Ray has also done some game show work as well and currently lives outside of Dallas, Texas. I got these two cards signed by Ray in no time flat. This Action Packed 1992 card is an exceptional photo with great lighting and focus and it’s among my favorite of the set.